[Since we skipped our Saturday blog entry, we’re doing a double header today.] As mentioned in a previous post, we were in Ohio last week, which afforded us the opportunity to do a bit of geocaching (hunting for items hidden by other geocachers, using a GPS receiver). Being in Western North Carolina in an area that is known for great geocaching, we had some experience under our belts and looked forward to broadening our search area to see what we could find. Armed with a rather long list of geocaches in Cincinnati, Wilmington, Westerville and Newark, we and the innpugs set out on a few choice hunts for caches. Unfortunately, we didn’t anticipate all the snow (how soon we forget Ohio winters!) and that made it much more of a challenge. We were able to find four caches, one each in Cincinnati and Wilmington, and two in Newark. Plus, we retrieved two travel bugs (trackable items that cachers place with the intent that other cachers will pick up the bugs to keep them moving). One travel bug that has traveled more than 3,800 miles from cache to cache has a mission to visit historical sites, so we have a few ideas of where to place that one. The other travel bug is attached to a little wrench — a very functional travel bug! It has traveled almost 3,850 miles. Out of our four caches, our favorite was an Earthcache called Geometric Mounds, located in Newark. The mounds are the largest set of geometric earthen enclosures ever built. They’re part of the Newark Earthworks complex of prehistoric Indian earthworks, constructed by a group of people who lived in the area from 200BC to 500AD. The people are sometimes called the Hopewell Indians, but only because some of their artifacts were discovered on the land of a farmer named Hopewell. They are also called the Moundbuilders. Since it was an Earthcache, there was no container or log to sign, but rather a requirement to take one’s picture at the visitor’s sign/map. Another one of our favorites was in Wilmington, called Sophie’s Stupendous Cache. 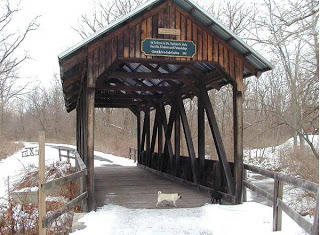 It was located off a bike path and the path had a really neat covered bridge (pictured above). We were fortunate that this cache wasn’t hidden under a foot of snow! Now that we’re back in North Carolina, we’ve logged in another find along Point Lookout Trail. What a great place for a cache. This entry was posted in Uncategorized and tagged geocaching, innkeepers and innpugs, Old Fort / Andrews Geyser, outdoors, Winter by Inn on Mill Creek. Bookmark the permalink. Sounds like a great round of geocaching, especially that earth cache.